안동차전놀이는 정월 대보름을 전후하여 안동지방에서 행해지던 민속놀이의 하나로 동채싸움이라고도 부른다. 유래에 대한 정확한 기록은 없으나 후백제의 견훤과 고려 태조 왕건의 싸움에서 비롯되었다는 설이 전해진다. 이 놀이를 위해 연말이면 안동 근처에서 적당한 나무를 미리 골라 두었다가 산신에게 고사를 지내고 나무를 베어 운반한다. 동채의 크기나 견고성이 싸움의 승패를 결정하는데 영향을 주기 때문에 동채를 만들 때는 사람들이 보지 못하도록 대문을 잠그고 만든다. 마을을 동서로 나누어 편을 가르는데 거주지가 아닌 태어난 곳을 위주로 편을 나누기 때문에 때로는 부부간에도 편이 다를 수 있다. 대보름날이 되면 동서 양편이 대치하고 서서 농악으로 흥을 돋우고, 동채를 들었다 놓았다 하며 기세를 올린다. 동채 위에는 대장이 올라 타고 떨어지지 않도록 왼손으로는 끈을 쥐고 오른손으로는 동채를 멘 사람들을 지휘한다. 동채 앞에서 힘센 장정들이 무리를 이루어 팔짱을 끼고 적과 부딪쳐 서로 어깨로 밀어 길을 낸 뒤, 동채가 밀고 들어가 상대방의 동채를 눌러 땅에 닿게 하면 이기게 된다. 하지만 싸움 도중에 자기 편이 유리한 순간이라도 적의 머리꾼이 쓰러져 위기에 처하게 되면 즉시 후퇴하여 구출하고 다시 승부겨루기를 한다. 안동차전놀이는 남자들의 집단놀이를 한층 세련되게 향상시킨 모의전투놀이로서 안동지방 특유의 상무정신을 엿볼 수 있다. 또 동부가 이기면 동부에 풍년이 들고, 서부가 이기면 서부에 풍년이 든다고 믿었기 때문에 농경민의 풍년기원을 바탕으로 한 농경의례놀이라 할 수 있다. 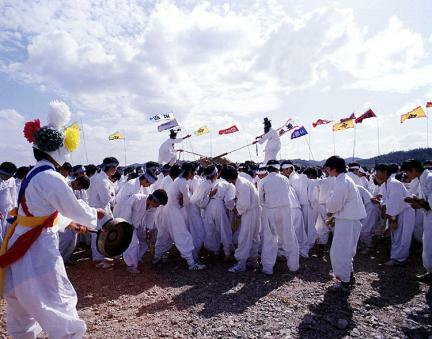 As a folk play performed in Andong around the full moon period of January 15 on the lunar calendar, it is said to have stemmed from the battles between Gyeon Hwon of Later Baekje and King Taejo (Wang Geon) of Goryeo. 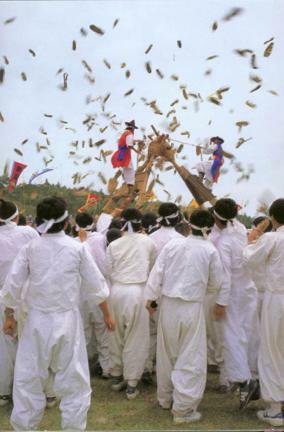 Villagers select good trees to be used for the play in nearby mountains toward the end of the preceding year, hold a sacrificial rite for mountain deities, fell them, and carry them to the village. Since the thickness and solidity of the trees are decisive factors of the battle, they work on the trees under tight security to prevent opponents from getting information on the trees. The village is divided into two sides according to their place of birth. 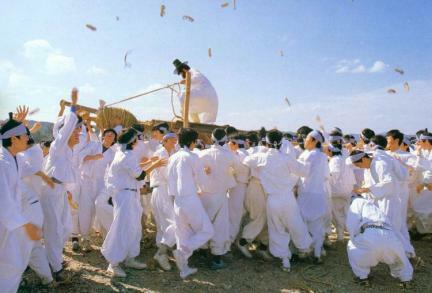 On the event day, farmers’ music is played to arouse people’s interest. 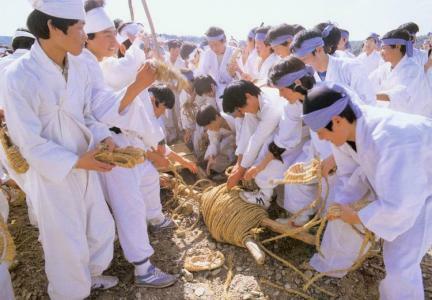 People stand on their side of the battle and try to discourage the other side by raising the wooden structure they made. 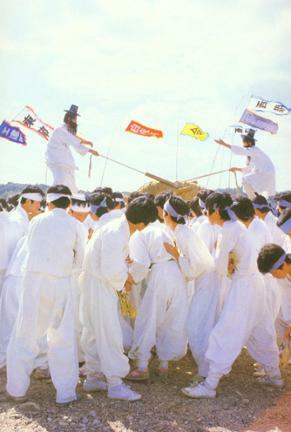 The leaders of the two sides stand at the top of the raised structure set up against that of the opponent team. 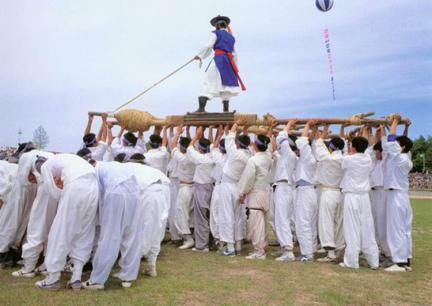 They balance their body by holding the string tied to the top of the structure and give commands to their team. 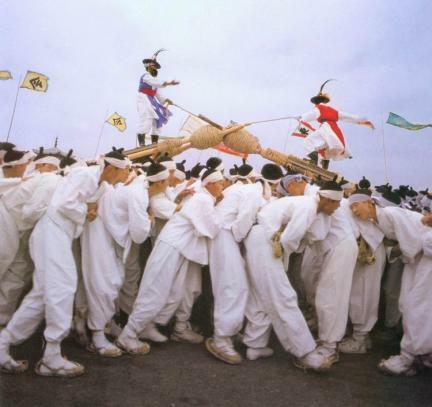 The team that makes the opponent’s wooden structure fall to the ground wins the battle. The beauty of the play lies in the spirit of fair play. 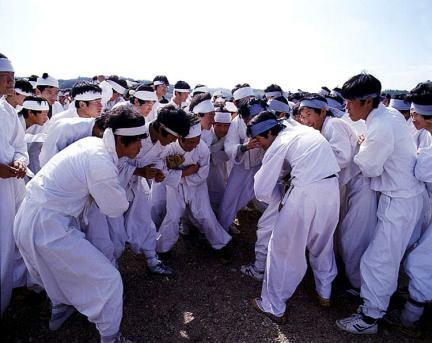 If any participant in the play is in danger, both sides immediately back off and get him out of danger before engaging in the battle again. 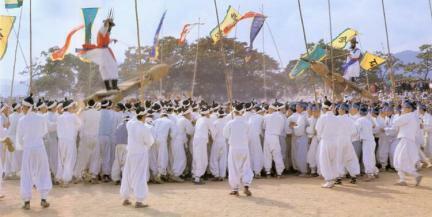 As a mock battle among males, Andong Chajeon Nori displays the martial spirit kept by the people in Andong. 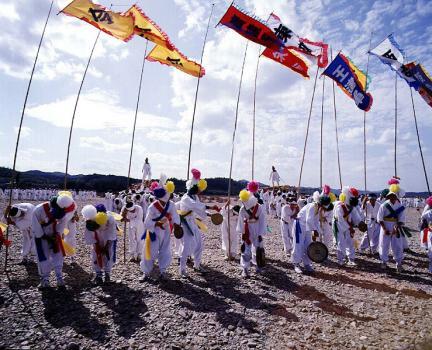 It is also a rite of praying for a good year for crops. 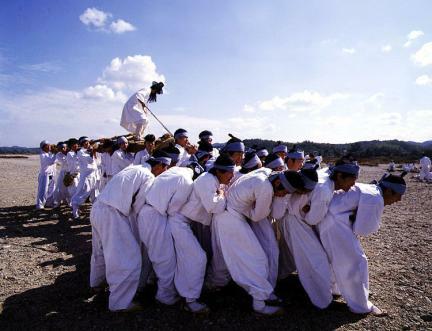 The winning side will reportedly enjoy better harvest in the year.